Walk-ins are always welcome. If you have to wait, at least you’ll enjoy your time watching all manner of shows on the big screen TVs that grace our waiting area. Come on in – we’re here to serve! Note: Due to high volumes we can no longer guarantee appointments (except for wedding parties – see below). Our apologies for any inconvenience this may cause. Walk-ins Preferred – We’re ready for you! *Actually, it’s included in the price, but you knew that. 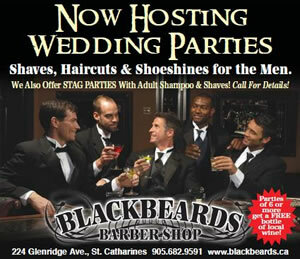 ** Senior and kids prices valid on weekdays only before 3:00 p.m.
Blackbeard and his crew are ready to serve wedding parties with the traditional haircut and shave services you’d expect at any barbershop.Reservation Deposit is Required. Blackbeards is now carrying the full line of LayRite and Reuzal Pomades. We also carry Moustache Wax, Straight Razors, Safety Razors, Beard Oils and Shaving Soaps. Come on in and check out our selection!